Thinking about trading in your cowboy boots, barbecue brisket, and wide-open plains for snow skis, craft beer, and mile-high mountains? If you’re contemplating a relocation from Texas to Colorado, brace yourself for some change. Though both states might have been considered part of the Wild West at one time, today, they are very different places to live. When moving to the Centennial State, you can look forward to loads of hiking trails, concerts at the Red Rocks, and lots of sunshine. And while you’ll probably love it once you get there, what about dealing with the logistics of your move? Here’s our overview of what you can expect when moving from TX to CO, along with tips for planning your relocation. Texas and Colorado share a love of sports, outdoor activities, and cowboy culture. But what are the differences between these two distant states? What can you expect from life in Colorado? Making a move as far as this one may be daunting, but there are a lot of appealing factors that attract people to Colorado in droves. There is no shortage of things to do in the Centennial State, especially if you enjoy being in the great outdoors. We’ve compiled a diverse list of facts you might want to know before making your move. There are 28 ski resorts scattered across the breathtaking Colorado mountaintops, totaling to a whopping 42,000 acres of marked ski slopes! The plentiful fresh and dry powder makes for an excellent snow day. Jump into boarding, skiing, sledding, or snowmobiling. Take a family trip or get an intense daylong workout. Ski towns can be expensive, but there are a lot of deals for Colorado snow bunnies too. Locals enjoy after-skiing discounts on appetizers, meals, and drinks. Colorado is a swing state with a congressional delegation nearly evenly split between Democrats and Republicans. Your political involvement will be influential in upcoming elections. Most Coloradans take their duty seriously—according to Denver Channel News 7, they had the second-highest voter turnout rate in the 2018 midterm elections. With spectacular views and an abundance of outdoor activities, it’s no surprise Colorado is one of the healthiest states in the country. The state’s obesity rate is a mere 20.4%, the second lowest in the US. The Colorado Department of Public Health & Environment states that Colorado is the second-lowest for cancer and cardiovascular deaths and the very lowest in diabetes prevalence. When it comes to Colorado, pot is an unavoidable topic. Adults 21 and older can possess and use marijuana, and they can attain it at some of the lowest prices in the country. Crime rates have fallen since the legalization of marijuana since 2012. While smoking marijuana may be relatively common, smoking cigarettes is exceptionally rare in Colorado. Only 17% of Colorado residents are cigarette smokers, and smoking is banned almost everywhere, from enclosed restaurants to casinos. Adjust your baking measurements based on the altitude. Reduce your alcohol intake. Alcohol is more potent at a higher altitude and hangovers are more intense. Take it easy during hikes and exercise as your body adjusts to the new environment. At first, you may not feel as fit as you were in Texas! Drink lots of water. It is common to experience mild dehydration and dryness during your first weeks and months in the state. Don’t forget the sunscreen! Being closer to the sun, you’re more likely to burn in Colorado. On the bright side, the “Mile High” city offers incredible mountain views and four temperate seasons. You’ll experience a lower average temperature than you’re used to in Texas, and of course, a lot more snow! However, you might be surprised at how sunny it stays in Colorado, with 300 sun-filled days each year. It’s undeniably a seller’s market in Colorado right now. Home prices have risen by almost 10% since 2014. On the other hand, Colorado’s average monthly energy costs are the lowest in the country! Colorado is a flat-tax state, where the income tax rate is 4.63% regardless of your income level. Colorado’s property tax rates are also some of the nation’s lowest at just 0.63%. You might notice more dogs out than children as you explore your new state. People adore their dogs and bring them everywhere, and since outdoorsy Coloradans are always outside, you’ll get to enjoy a parade of unique and friendly dogs every day! If you have a dog, they’ll be satisfied with your relocation. There are countless dog parks, trails, and beaches for pups in Colorado. 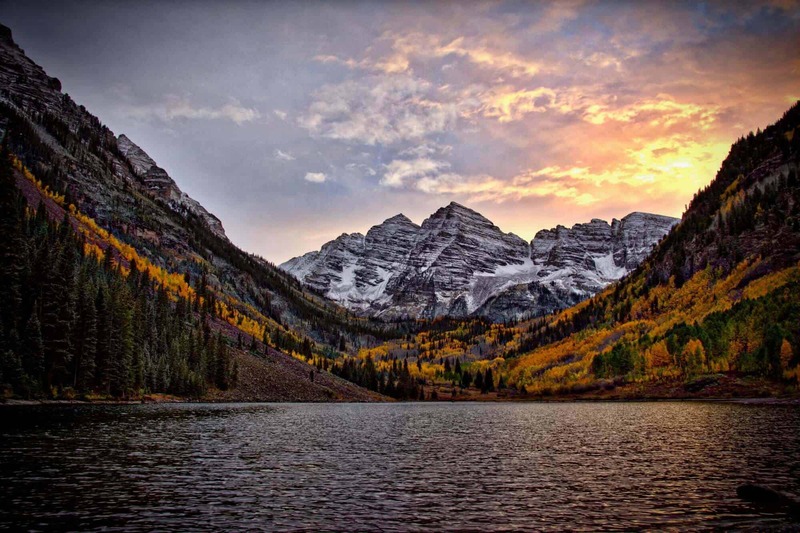 Did you know Colorado is considered the second happiest state in the country? According to the Denver Post, a 2018 study shows that Coloradans are the second most satisfied people in the nation, just after Hawaiians. There is a different attitude in Colorado, where many people work to live instead of living to work. You’ll find that your neighbors are generally outgoing and friendly. Many Coloradans would describe the environment as more relaxed than competitive—you can forget about keeping up with the Joneses! Colorado is also considered an excellent place for startups because business costs are well below the nation’s average. Music lovers will be thrilled at the proximity to live indoor and outdoor music venues. Red Rocks Amphitheater and other stellar sites consistently host big-name concerts. Colorado caters to diverse art and music tastes with venues like Cervantes Masterpiece Ballroom or DazzleJazz. For music or art aficionados, there’s something to do almost every night of the week in and around Denver. You will find that Colorado is well-connected with all the US as well as several international destinations. The state boasts an excellent network of airports, buses, trains, and highways. The Denver International Airport offers direct flights to 22 international destinations in nine different countries. It’s even easy to get to the airport with the new Train to the Plane commuter rail. Jetsetters can also catch a flight out of the Grand Junction or Colorado Springs airports. You can get anywhere in Denver by light rail or bus. Boulder, Longmont, Aurora, Littleton, Lakewood, Golden, Arvada, and other cities also have efficient and inexpensive public transportation. If you’re anywhere near Denver, the highways can host considerable traffic at times. Colorado offers nine Colorado Welcome Centers that offer friendly face-to-face travel advice, maps, hot coffee, Internet access, and well-kept restrooms. Colorado’s graduation rate is above the national average at an outstanding 90%. Colorado ranks as the tenth state in the “Chance for Success” education category, which represents the likelihood of a student’s success throughout their lifetime. There are countless opportunities for higher education throughout the state, including the University of Colorado and the US Airforce Academy. Now that you’re familiar with the state of Colorado let’s get more specific. Where are the best locations in the state to live? The Colorado area you choose for yourself, your roommates, or your family will determine what life is really like after the move. We have compiled a list of seven of the best cities in Colorado. Read on to find your best match in categories like culture, amenities, and community! Aurora has some great nicknames including “Gateway to the Rockies” and “The Most Active City in America.” Aurora is considered a suburb of Denver, so you’re just a few minutes away from a lively music and arts scene and endless career opportunities. A great place for families, Aurora offers the best youth sports and tournaments. Not only does it enjoy a low crime rate of about 17 crimes per 1,000 residents, but Aurora dwellers enjoy access to high-quality healthcare including The Children’s Hospital Colorado, which is consistently ranked one of the best pediatric medical centers in the country! With the Aurora Cultural Arts District nearby, you’ll find there’s plenty of culture too. The district offers an annual calendar of musical and theatrical activities, classes, and performances for attendees of all ages. Boulder’s University of Colorado is a significant perk of living in this city. The University provides thousands of open acres for outdoor recreation. If you move here, you’ll also find Eldorado Canyon State Park and Boulder Canyon right in your backyard! Get into hiking and biking or take on a bigger challenge with snowshoeing or ice climbing. But don’t worry, Boulder isn’t limited to the great outdoors. You’ll also love the diverse dining options, shopping, and coffee houses on every corner. Are you single? Boulder is also on the Best Cities for Singles list, recently featured in the number one spot! Groups of fun singles of all ages regularly gather for outdoor activities and the sizzling nightlife. Boulder has enjoyable mild temperatures throughout the year due to the mountain breezes. Winter weather doesn’t begin until much later in the year, sometimes not even until January. Boulder’s population lies at just over 107,000 with a crime rate of about 38 per 1,000 residents. The city’s major employers are government research facilities and the University of Colorado. Castle Rock is an affluent enclave centered around Interstate 25, between Denver and Colorado Springs. The population of this small town is just over 62,000 with a crime rate of 16.18 per 1,000 residents. A great place to raise a family, Castle Rock is notable for its academic excellence. The area is served by the Douglas County School District, which according to the U.S. Department of Education, has various programs in place for teacher and district improvement. The district also provides a school choice/open zone policy so that parents can send their children to the school of their choice without boundaries or limitations. Top employers in Castle Rock include ACME Brick, Plum Creek Golf & Country Club, IMI Global, and many more. Additionally, the town is an easy drive from both downtown Denver and the northern reaches of Colorado Springs, making this an ideal location for those who want to live in a quieter area and commute into work in the city. Many Castle Rock residents work in the tech industry and make the daily drive to the Denver Tech Center, just a short 20-minute drive north. Castle Rock is another beautiful spot to enjoy nature. Enjoy a quick hike at Mitchell Creek Canyon Trail or Ridgeline Open Space. Or take it indoors at the Miller Activity Complex, where you’ll find over 64,000 square feet with exciting recreational activities ranging from an indoor pool to batting cages. Colorado Springs is a military hub with facilities that include Fort Carson and the US Air Force Academy. Tourism bolsters the city’s economy, and if you don’t mind the crowds, you too can take advantage of all the city’s destinations and adventures. Some Springs dwellers find the area more affordable than other cities in Colorado. The real estate is significantly cheaper than options in Denver, encouraging many Denver-based professionals to live in Colorado Springs and make the hour commute. The affordable housing market is one of the most attractive factors for singles and families alike. There’s always a party going on in Colorado Springs! Take a trip downtown to the national historic district for mouthwatering meals and bars with live music. You’ll discover art festivals, farmer’s markets, and other community events. Or opt for the breathtaking views on a hike in the Garden of the Gods or Pikes Peak! The crime rate of Colorado Springs is about 40 per 1,000 residents with a total population at about 465,000. Some relocate to Denver for career and business prospects. Others are intrigued by life in the big city. Overall, despite its high cost of living, Denver is one of the most preferred living areas in the state. You get a little bit of everything living in Denver. With the Red Rocks Amphitheater and the Denver Arts Museum, Denver is considered a mecca for the arts and music. On the other hand, there’s also no shortage of rabid sports fans with teams like the Broncos, the Rockies, and the Nuggets. Denver’s college campuses fuse life and excitement into the city! The Denver nightlife is top notch, landing in the top five for breweries and bars per capita. Denver is growing in aerospace and defense careers, mostly due to the presence of Lockheed Martin. Of course, there are also lots of educational and research opportunities based in the universities. There are countless significant employers in varying fields from healthcare to finance. The Denver crime rate is about 43 per 1,000 residents, with a population of 705,000. Living costs in Denver may be slightly higher than the rest of the country, but still lower than big cities like San Francisco or New York. Denver has been one of the fastest growing cities in the country for a few years now, and for a good reason! Did you know Disneyland’s Main Street USA was modeled after downtown Fort Collins? There is definitely something magical about this city of 165,000! An excellent place for outdoor adventurers, you can float down the Cache La Poudre River or go horseback riding at Horsetooth Mountain Open Space. Adrenaline junkies can try waterfall hiking or whitewater rafting during the summer months. You’ll see many Fort Collins residents riding bikes, even renting them from the downtown bike library. Many Colorado towns are considerably outdoorsy, and Fort Collins is no different! Some of the major employers in Fort Collins include Advanced Energy Industries, Inc. and Columbine Health Systems. Fort Collins also has an impressive technology sector with big-name companies like Hewlett Packard. Despite its foothold in technology, this progressive city still retains a small-town feel. You can explore dozens of historic buildings like the Avery Building or Poudre Landmarks Foundation. On your way out, stop by a welcoming restaurant or a painting workshop. South of Denver, you’ll find Littleton. With a population of 47,734 and a crime rate of 29 incidents 1000 residents, Littleton has the appeal of both big city life and country bliss. You’re only 20 miles to downtown Denver, so whether you’re commuting to work or visiting for pleasure, the commute is very doable. Many Littleton residents commute to Denver to work for major employers like HealthONE Corp, Qwest Communications, and Centura Health. Activities are everywhere in Littleton. Classical music fans will be interested to see the Littleton Symphony Orchestra or Littleton Chorale in concert. The city is an old-town retail paradise with antique shops and clothing boutiques lining the downtown area. Visit the Littleton Museum to get a feel for what the farm life was like in the 1860s. Littleton is a place for families; the demographic in the city is kids under 18. Families love the Littleton education system. It is the only school district in the Denver Metro area to be awarded the Accredited with Distinction by the Colorado Department of Education seven years running. Little ones will also enjoy the beautiful Bemis Public Library along with many other educational programs and facilities. When you decide that relocating to Colorado is right for you, it’s time to finalize your move. Whether you are planning to move in several months or less than a week, a long-distance move is a serious undertaking. We want to reduce your stress by providing you with a “must-do” moving list. This list covers all major pre-moving tasks without becoming overwhelming. Enjoy this must-do moving checklist; we hope it simplifies the process for you! Have you already found your new home or apartment? If not, jot down three or four features that are most important to you. Is a large master closet a must? Do you prefer a fenced backyard or a community pool? How flexible is your budget? Speak with a real estate professional and schedule a weekend to travel to your new hometown to look at options. Some individuals choose to move to a short-term housing situation if they are unable to explore the area in-person before relocating. They might select a well-rated apartment complex online and then find permanent accommodations once they are familiar with the city. Perhaps you have already found your perfect new Colorado home. Congratulations! Pin down your ideal moving day with an excellent cross-country moving company. When you reserve movers in advance, you have a moving deadline so that you can plan the time frame of all relocation tasks. Most importantly, your movers will eliminate all the heavy lifting and stress of moving day. It looks like you’re already researching your moving needs online. The next step is to start gathering quotes. Great Guys Long Distance Movers enables you to submit a quote request and get estimates from multiple licensed moving companies in one place. From there, you can narrow the field and start asking questions. Our network of movers is happy to help you in any way they can. First and foremost, change your address with your local post office. Next, call and cancel your heat, internet, and other utilities and services. Make sure service ends the day after you move so that your home or apartment will still be livable on moving day. Look to the other side of the move as well, and call and set up all your new utilities in Colorado. Collect your packing materials from your movers or local home improvement stores. Next, it’s time to begin decluttering and packing only what you need. Remember, getting rid of as much clutter as possible is going to save you time, money, and hassle. We all accumulate things we don’t need over time. You can view moving as an opportunity to simplify and organize your life! Consider your new home and the space you have. How much will fit seamlessly into your new place? Consider large items like furniture, equipment, etc. Any item that you do not use regularly and does not have great sentimental value can go. You can get rid of everything in a responsible way. Try garage sales, Facebook Marketplace, eBay, or any number of reselling phone apps. You can take photos of some of your nicer things and send them to family, friends, co-workers, and acquaintances. They might be interested in buying or at least taking them off your hands. You can also throw a big giveaway event at your place. Anything else in good condition can go to places like Goodwill or local charities. Items that are in poor condition should be recycled or thrown away. Once you’ve whittled your possessions down to the things you need and love, it’s time to pack. We recommend labeling your boxes with the room and the contents, for example: “KITCHEN: DISHES” so that you or your movers know precisely where to place each box in the new home. If there’s anything you want coming with you instead of the movers, find a unique way to label those boxes and separate them from the rest. Don’t forget to complete a thorough cleaning of everything once the movers depart! Plan out your route and consider potential stops and timing. You may want to collaborate with anyone else who will be driving or riding with you. If you need to meet anyone to get keys once you arrive in Colorado, be sure to arrange a time. Review your vehicle insurance coverage and any other coverage you may want on your valuable items during the move. You may want to reserve a few hours of your busy time during this transition for goodbyes. Say “see ya” to both people and places you love. You can spread your goodbyes out over a few weeks or select one night for a big get-together with all your loved ones. Don’t forget to snap some pictures! Our goal is to make your goodbyes and hellos as sweet as possible! Once you complete this checklist, you should be in the clear. We hope all this information along with your movers, friends, and family eliminate much of the stress of moving day. The smoother the move is, the more you will enjoy saying “hello” to your new Colorado home!